House Speaker Joe Aresimowicz and House Majority Leader Matt Ritter promising a “historic” budget. 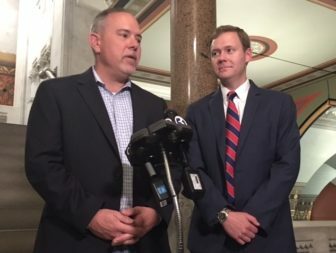 Legislative leaders say the General Assembly is poised to end Connecticut’s long and bitter budget impasse in dramatic fashion by week’s end, uniting one of the nation’s most closely divided legislatures behind a bipartisan compromise engineered to survive a veto by Gov. Dannel P. Malloy. The Senate is expected to open debate on the budget early Wednesday evening, hours after the legislature’s nonpartisan staff delivers a line-by-line budget for the fiscal year that began July 1. The House probably would follow with a vote Thursday, setting the stage for Malloy to sign or veto a budget crafted without his direct involvement. In separate press conferences Tuesday, House Democrats and Republicans broadly sketched the basis of a bipartisan compromise once seen as unthinkable: The University of Connecticut would lose about $65 million in annual funding, more than the $50 million Malloy was ready to accept last month, but far less than the $120 million originally sought by the GOP. The state’s public financing of campaigns would survive, as would the state’s portfolio of green energy and energy efficiency programs, though the latter would lose some funding. Municipal aid would be largely preserved, though no town-by-town numbers were released, normally a prerequisite for any lawmaker committing to a budget. House Minority Leader Themis Klarides talks to reporters. House Minority Leader Themis Klarides, R-Derby, said her caucus was pleased that the budget deal includes elements of proposals long sought by the GOP, including revisions to prevailing wage and binding-arbitration laws, as well as new language for caps on spending and borrowing by the state. Details were not released. 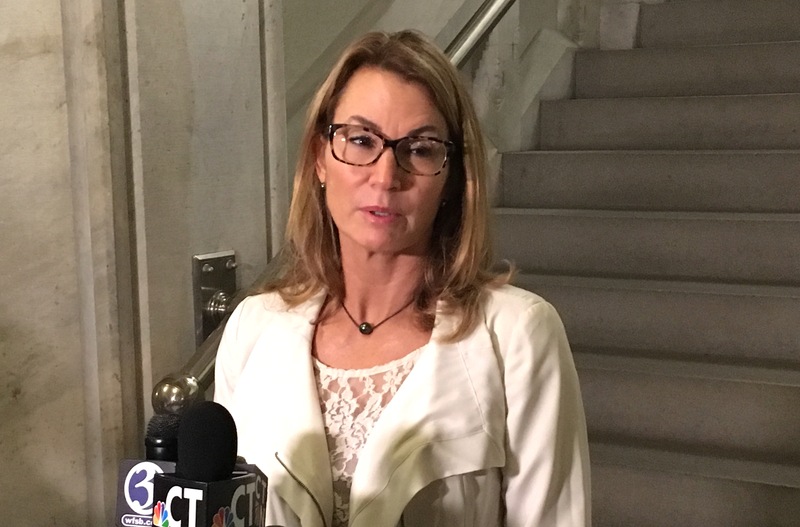 “I think overall people were very impressed with the historic amount of structural change we got in this budget,” Klarides said after the GOP caucus. One of the changes is a statutory requirement that bars state labor contracts and binding arbitration awards from taking effect without a vote by the legislature. Under current law, contractors and arbitration awards can take effect without an affirmative vote by lawmakers. The threshold for applying the prevailing wage requirement to municipal projects would increase from $400,000 to $1 million, according to a message one GOP lawmaker sent to constituents. The labor changes sought by Republicans were a sensitive issue for Aresimowicz, whose employment outside the part-time legislature is a $100,000-a-year job with one of the state’s largest public-sector unions, Council 4 of AFSCME. 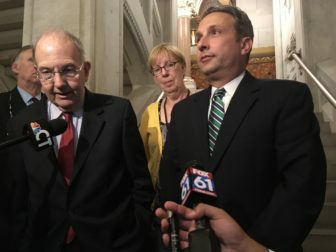 Aresimowicz, who was employed by the union before his election to the legislature, said he left negotiations about labor changes to House Majority Leader Matt Ritter, D-Hartford. Many questions remain about the details of the bipartisan deal and its potential consequence, including whether it will change the political culture of a General Assembly, where budgets long have been intensely partisan, or the dynamics of the 2018 elections. The Republican playbook for winning control of the General Assembly next year for the first time since 1984 was expected to revolve around a strategy of blaming Democrats, who also regained the governor’s office in 2010 for the first time in two decades, for the state’s chronic fiscal woes. In a blue state, Republicans have achieved near-parity at the legislature, rebounding from a low point in 2008, when Democrats won majorities of 114-37 in the House and 24-12 in the Senate. Democrats now have a narrow majority of 79-72 in the House and are tied, 18-18, in the Senate, where their only advantage is the ability of Lt. Gov. Nancy Wyman to break ties. The new political order was made evident last month, when three Democrats in the Senate and five in the House helped the GOP defeat a Democratic budget and pass a Republican alternative that was vetoed by Malloy. Over the past three weeks, legislative leaders have been negotiating without Malloy. Aresimowicz downplayed the governor’s absence from the talks. The governor offered praise Tuesday night for one apparent concession by lawmakers: They will mitigate the extent to which they will divert money from the Green Bank and another energy conservation program supported in large part by surcharges on consumers’ monthly utility bills. The Green Bank diversion sparked considerable debate this week after clean energy advocates — including the governor — noted that each dollar of state funding in this program leverages $8 to $10 of private investments. Legislative leaders did not disclose final numbers. But sources said leaders were looking to retain but reduce the diversion from the Green Bank and increase the dollars drawn from the Energy Efficiency Fund. Senate President Pro Tem Martin Looney, left, and Senate Majority Leader Bob Duff say a budget document is coming. Legislators will rely on a mix of tax hikes, fund sweeps and other revenue enhancements, and a broad range of spending cuts to close major projected deficits. Analysts say finances, unless adjusted, will run $1.6 billion in deficit this fiscal year and $1.9 billion in the red in 2018-19. The single-biggest tax hike in the plan would raise the annual tax on hospitals by $334 million, from $556 million to $900 million. But the state would not benefit by that much. That’s because Connecticut would return all of those funds to the hospital industry, and then some, to qualify for additional federal Medicaid reimbursement. The net projected revenue gain to the state is estimated at $137 million per year. Legislators also would raise income taxes on middle-income households and on the working poor — not by raising rates, but by reducing credits. The new budget also would raise the cigarette tax by 45 cents per pack, pushing the levy to $4.35. This would place Connecticut in a tie with New York for the nation’s highest cigarette tax. The new budget will not include Malloy’s proposal to shift a portion of the cost of teacher pension onto cities and towns, which currently contribute nothing. Instead, contributions from teachers will increase from 6 percent to 7 percent of their salaries. But the provision is a budget maneuver that ultimately brings more money to the general fund, not the teacher pension system: As the teachers increase their contributions to their pension fund, the state will reduce what it pays — a boost to the general fund. Retired teachers, who receive a 25 percent exemption for their pensions from the state income tax, will not see that tax break climb to 50 percent with the returns they file next spring, as originally enacted three years ago. A proposal to repeal municipal property taxes on motor vehicles starting in July 2018 was stripped from the plan after city and town leaders objected to the loss of $800 million in revenue with no state plan to compensate for the loss. But legislative leaders said the state cap on motor vehicle taxes would rise from 37 mills to 39 this fiscal year, and to 45 mills in 2018-19. Aresimowicz said lawmakers intend to revisit the property tax issue during the 2018 legislative session and will explore alternatives that could make the 45-mill cap unnecessary. Education Cost Sharing grants to most cities and towns — the state’s primary vehicle for providing local education aid — would be cut by 5 percent or less, sources said. And payment to the lowest-performing school districts largely would remain flat. Malloy wanted a shift to the communities of greatest need. Rep. Daniel Rovero of Killingly, a moderate Democrat who supported the Republican budget in mid-September said he probably would back the compromise plan. “I want to read it, but it didn’t cut anybody really drastically” in terms of local aid, he said. “And there’s no real big tax increases. Aresimowicz and Fasano both said the new budget also addresses another major concern of the governor’s: A mandate from the legislature for the administration to find cuts it could not. The governor said he already would be challenged to hit the savings targets he proposed — $838 million this fiscal year and just over $1 billion in 2018-19. Malloy balked when the Republican plan he vetoed tried to add $260 million to those targets over two fiscal years combined. But leaders said the new deal adds less than $20 million to the governor’s target each fiscal year. Legislators took this concern of Malloy’s seriously, Ritter said. As late as Monday, some legislators suggested closing a lingering gap of $30 million in annual finances by adding that onto the governor’s savings target as well. Instead “we sat there for 90 minutes” to find other spending cuts to avoid handing that challenge off to the governor, Ritter said.